What a better way to spend the evening then strolling around the beautiful VanDusen Botanical Garden, tasting wine from Summerland’s Bottleneck Drive Winery Association and eating delicious offerings from food stations? 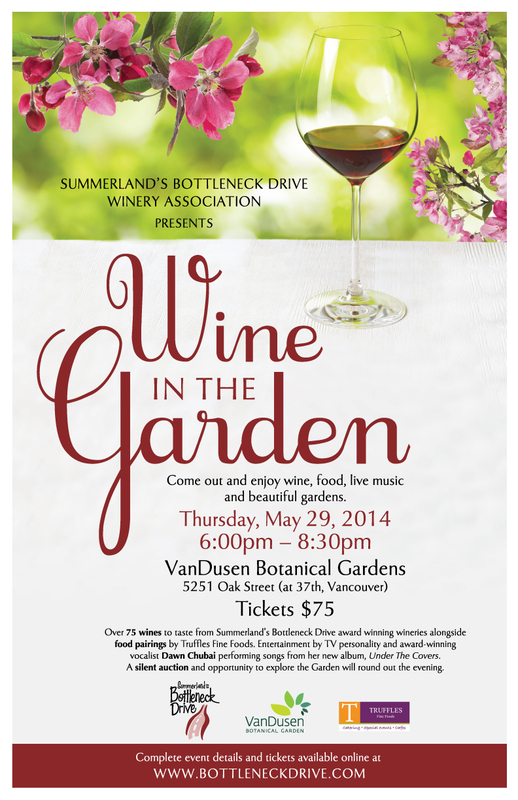 Don’t miss the first event of its kind, Wine in the Garden, happening on Thursday, May 29th from 6-8:30pm. You’ll have the chance to taste from 14 Summerland wineries with over 75 wines to try, food stations from Truffles Fine Foods and live music from Dawn Chubai. There will also be a silent auction at this event benefitting the Garden. Tickets are $75 each and can be purchased from Bottleneck Drive.